The term “wintry mix” is often heard at this time of year. But don’t use it to describe an upcoming Christmas concert at Conwell-Egan Catholic High School. The program for the Dec. 20 performance will be “very Christmas-heavy” with an emphasis on sacred music rather than generic holiday songs, according to Thomas Kuchler, the school’s director of performing arts. “Being able to present this repertoire is one of the benefits of teaching in a Catholic school,” said Kuchler, a Cheltenham native who actually graduated from that township’s public education system. 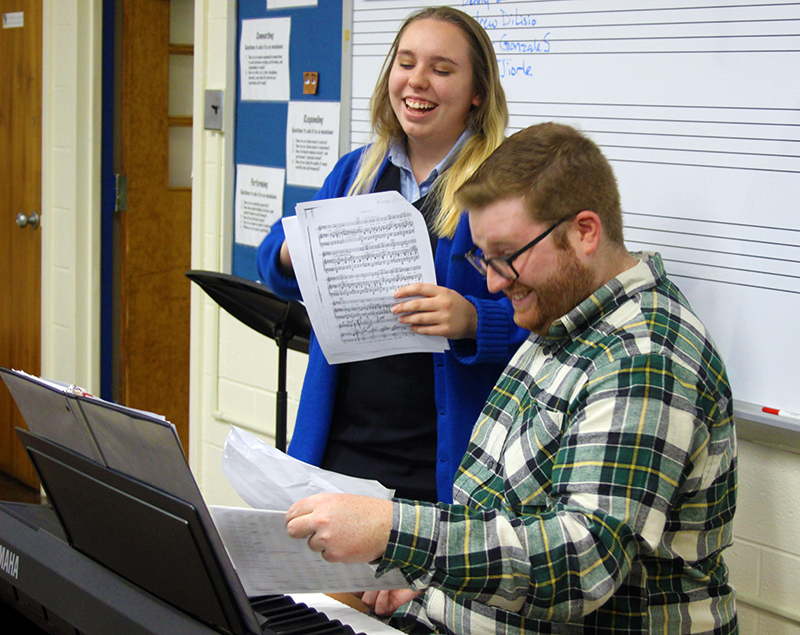 Now in his third year of teaching at Conwell-Egan, Kuchler is passionate about music and faith – and about sharing both with his students. Growing up in Presentation B.V.M. Parish, Kuchler regularly attended PREP (Parish Religious Education Program) classes and became involved in music ministry from an early age. While attending a vacation Bible school one summer, he met the parish’s music director, who recommended him for the children’s choir. By the time he was a freshman in high school, Kuchler was cantoring at Presentation; a few years later, neighboring parishes began inviting him to do the same. Liturgical music, which was “accessible and familiar” to Kuchler through his family’s regular Mass attendance, led to both a ministry and a career. By the time he was in seventh grade, Kuchler had already decided to become a music educator. “I knew, even at that age, that I wanted to provide an education and a space for kids who liked music and wanted opportunities to perform,” he said. After graduating from the University of Delaware in 2016, Kuchler applied for his first teaching position, having learned of the post through Don Holdren, chair of fine arts at Mount St. Joseph Academy, and as director of the choir at St. Christopher Parish in Philadelphia, a fellow liturgical musician. “I started at Conwell-Egan on my birthday,” Kuchler recalled. Although still relatively new to teaching, Kuchler has clear convictions about the importance of arts in education, which in recent years has tended to focus on science, technology, engineering and math — an approach often called “STEM”-based pedagogy. 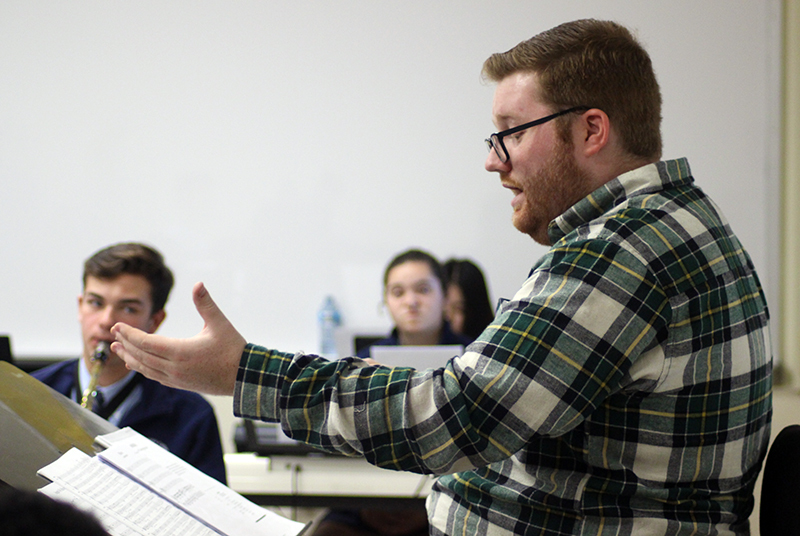 In addition to leading a fine arts seminar for 150 students, Kuchler devotes hours of classroom and preparation time to his student ensembles, which include a concert choir of 48, a concert band of 32, a chapel choir, and a praise and worship ensemble. Involving youth in liturgical music fosters both their personal and spiritual growth, said Kuchler. Teens build confidence by learning to sing in front of their peers, while strengthening their faith and learning to steward their God-given talents. Kuchler hopes his students will in turn make use of those gifts in their own parishes, since music is a vital means of engaging with the liturgy. “It can help you understand the message of the Mass in a way you wouldn’t have otherwise,” he said. Junior Stephanie McBeth, who plays saxophone in the concert band, agrees. A member of Our Lady of Grace in Penndel, McBeth sings in her parish choir, and accompanies her father (who plays guitar) at Christmas Eve Mass. Kuchler’s enthusiasm even makes learning challenging compositions fun. “His energy makes me extremely excited about the music we’re playing, even if we don’t always like the pieces,” said sophomore Egan Rigney, who plays saxophone in the concert band. Ten of Kuchler’s students have been selected for the archdiocesan All Catholic Chorus. Bridgett Baker, one of those students, is now contemplating a music education career herself. As part of that commitment to expanding students’ horizons, Kuchler works with Conwell-Egan’s newly launched Center for Student Leadership. Directed by Shane Roxberry, the center cultivates a range of professional internships and mentoring opportunities. Kuchler’s nonstop schedule – which includes liturgical music projects throughout the archdiocese, a principal soloist role in St. William Parish’s choir and summer conducting engagements in France – reflects his commitment to musical and educational excellence. Conwell-Egan Catholic High School’s Christmas concert and bonfire will take place on Dec. 20 at 6:30 p.m. Admission is free. For more information, visit the school’s website at Conwell-Egan.org. You are doing a great job. You and your work are in my prayers.